Today Energy and Commerce Committee Ranking Member Henry A. Waxman, Natural Resources Committee Ranking Member Edward J. Markey, and Oversight and Investigations Subcommittee Ranking Member Diana DeGette released a new report that summarizes the types, volumes, and chemical contents of the hydraulic fracturing products used by the 14 leading oil and gas service companies. The report contains the first comprehensive national inventory of chemicals used by hydraulic fracturing companies during the drilling process. During the last Congress, the Committee launched an investigation into the practice of hydraulic fracturing in the United States, asking the leading oil and gas service companies to disclose information on the products used in this process between 2005 and 2009. The 14 leading oil and gas service companies used more than 780 million gallons of hydraulic fracturing products, not including water added at the well site. Overall, the companies used more than 2,500 hydraulic fracturing products containing 750 different chemicals and other components. The components used in the hydraulic fracturing products ranged from generally harmless and common substances, such as salt and citric acid, to extremely toxic substances, such as benzene and lead. Some companies even used instant coffee and walnut hulls in their fracturing fluids. Between 2005 and 2009, the oil and gas service companies used hydraulic fracturing products containing 29 chemicals that are known or possible human carcinogens, regulated under the Safe Drinking Water Act (SDWA) for their risks to human health, or listed as hazardous air pollutants under the Clean Air Act. The BTEX compounds â€“ benzene, toluene, xylene, and ethylbenzene â€“ are SDWA contaminants and hazardous air pollutants. Benzene also is a known human carcinogen. 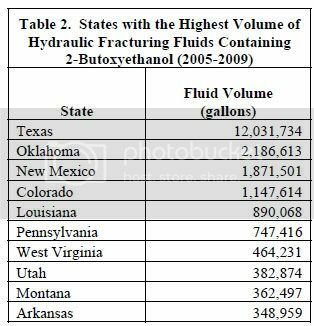 The hydraulic fracturing companies injected 11.4 million gallons of products containing at least one BTEX chemical over the five-year period. Methanol, which was used in 342 hydraulic fracturing products, was the most widely used chemical between 2005 and 2009. The substance is a hazardous air pollutant and is on the candidate list for potential regulation under SDWA. Isopropyl alcohol, 2-butoxyethanol, and ethylene glycol were the other most widely used chemicals. 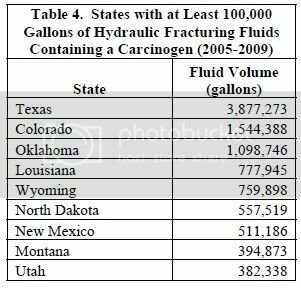 Many of the hydraulic fracturing fluids contain chemical components that are listed as â€œproprietaryâ€� or â€œtrade secret.â€� The companies used 94 million gallons of 279 products that contained at least one chemical or component that the manufacturers deemed proprietary or a trade secret. In many instances, the oil and gas service companies were unable to identify these â€œproprietaryâ€� chemicals, suggesting that the companies are injecting fluids containing chemicals that they themselves cannot identify. Due to an embargo break, the committee is releasing the report this evening iead on Monday morning. 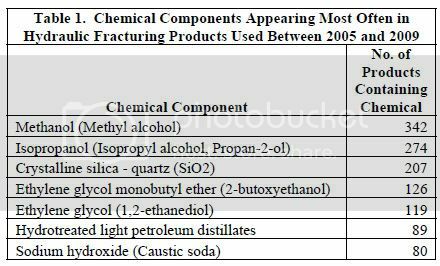 Hydraulic Fracturing Report, April 18, 2011.
measured by the number of products containing the chemical, was methanol. Methanol is a hazardous air pollutant and a candidate for regulation under the Safe Drinking Water Act. products containing 2-BE in Texas, which accounted for more than half of the volume used. 2 shows the use of 2-BE by state. hydraulic fracturing. Table 3 lists these toxic chemicals and their frequency of use. The Committee requested that these companies disclose this proprietary information. The proprietary information belongs to the suppliers, not the users of the chemicals. There are 18 PAGES OF CHEMICALS LISTED in the source PDF. This is how they are poisoning our water supply. 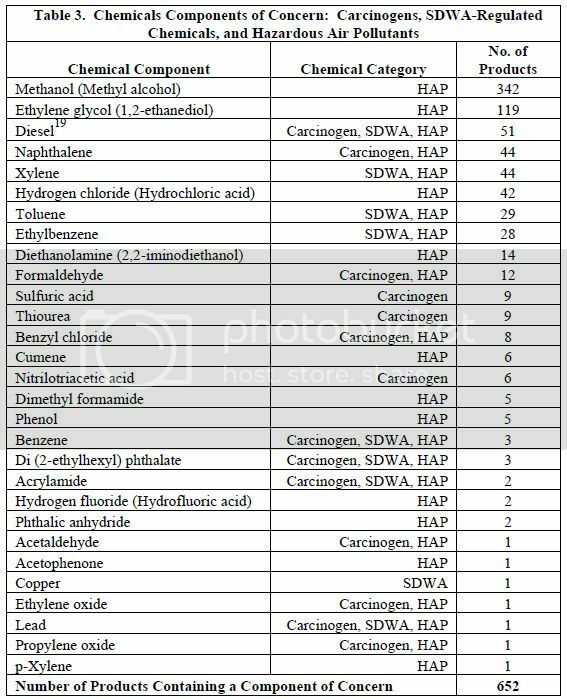 Table of chemicals used to destroy the water supply of the US mainland: Pages 13 - 30.